The transformation of St. Lukaskirche in Leipzig, Germany from a worn out structure to an amazingly beautiful and historically restored building also exemplifies the congregation within. The beauty of the church pales in comparison to the beauty of the Gospel that is proclaimed inside and the seeds that its members have planted in a community that may, at times, seem as tired and weary as the old church had become. The vibrancy and faith of the congregation shone through every detail of the dedication service for the newly renovated building on June 24, 2018. The entrance to St. Lukaskirche shows the breathtaking beauty of the newly renovated church. Greeted at the front entrance to the church by a German brass band, the first steps into the St. Lukaskirche sanctuary revealed its breathtaking makeover. 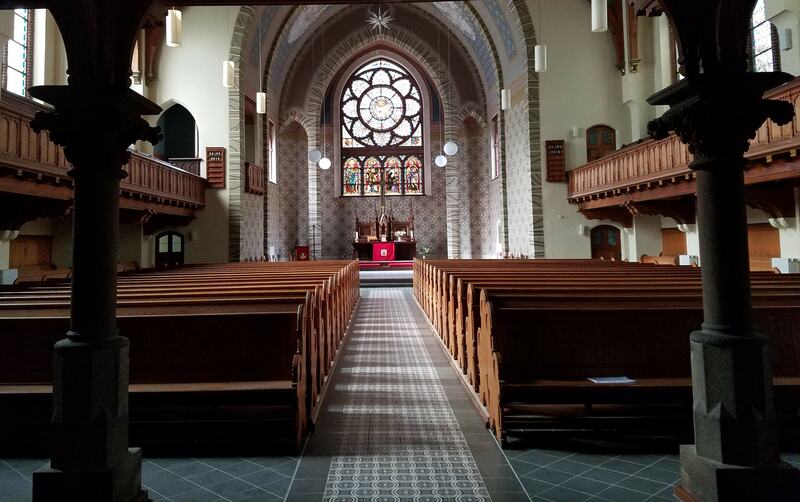 Dating back 125 years to when it was first dedicated on March 19, 1893, the church now has restored the beauty of the original, massive wooden pillars, beams and pews. The floor tiles and paint closely match the original furnishings, thanks to a generous congregation member who donated hundreds of hours of his professional historical architecture training to each detail. 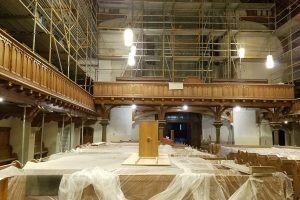 His work as a construction engineer also provided expertise to the church in managing the construction progress with various companies and carefully reviewing invoices after work completion. Other volunteers included local members and three week-long construction camps, where teams came to tear out unsafe fixtures and help replace them with updated and safer facilities. One of the construction camps included many Lutheran Church-Missouri Synod (LCMS) members. Days before the dedication, the historic altar returned, in time to be rededicated at the service. 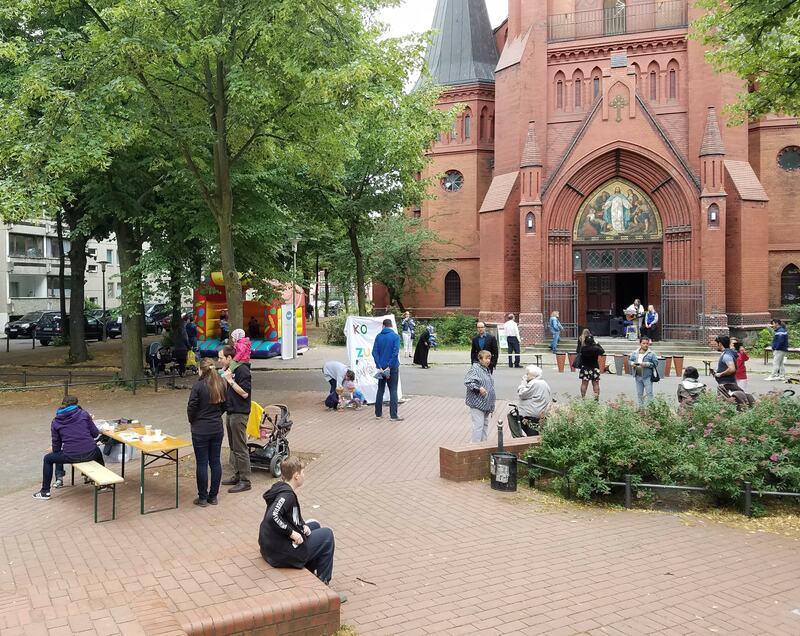 St. Lukaskirche opens its doors to the community through Christian outreach. The June dedication service reflected the diversity of members and the gifts they bring to the church. The opening procession included young and old, German and Persian members. The Word was proclaimed in German and Farsi, with Scripture readings by congregant members in their native tongues. Beautiful German hymns glorified God, as well as the bone-chilling Farsi solo, “Hallelujah,” performed by an extremely talented Persian member of the congregation. Pastor Fischer explained how important it is to preserve the cultural identity of its Persian members. He said, “We don’t just take German hymns and translate the words to Farsi. They are very involved in writing music that fits their language.” Pastor Gevers is instrumental in ensuring that the sanctity of the Word is preserved in the text of the hymns. 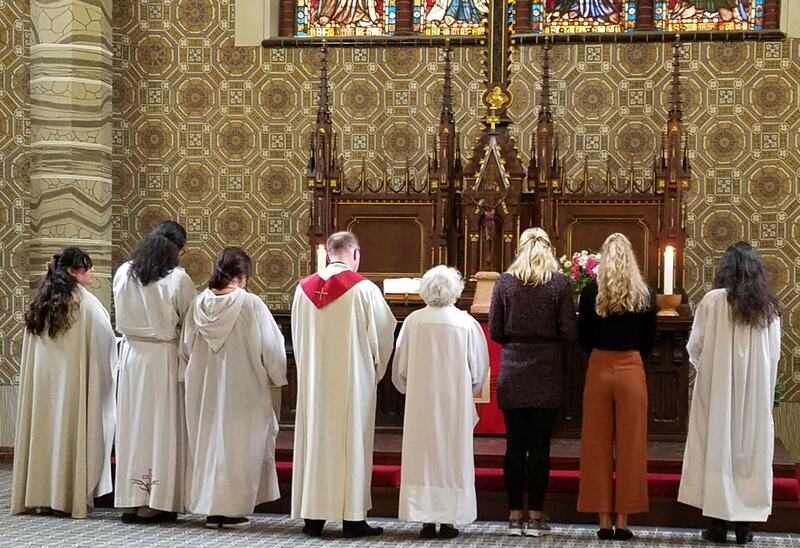 The dedication service included German and Farsi prayers offered by pastors and congregation members at the historic church altar. The LCMS provided a generous grant to help with the repairs and restoration of St. Lukaskirche. Greetings and thanks were presented to the LCMS at the dedication ceremony on behalf of the congregation by SELK (Selbständige Evangelisch-Lutherische Kirche) Bishop Voigt, as well as pastors and congregation leaders. The LCMS now has two missionaries placed in Leipzig to help with refugee outreach, Deaconess Kim Bueltmann and Deirdre Christiansen. They work with the pastors at St. Lukaskirche to reach unchurched members of the community, as well as Muslim refugees that have settled nearby. St. Lukaskirche offers a haven today for the weak and weary, the tired and worn out. Like the transformation of the old church building, the life-giving Word and Sacrament given freely by Christ through His church nourishes and sustains even the weakest in their faith. All are welcome to come through the doors and experience this life-changing transformation.